In this new monthly food history series, we’ll take a look at individual foods that originated in — or are otherwise associated with — London. We’ll discuss their history, share their recipes, and tell you where you can currently enjoy them. Occasionally we’ll talk to chefs and food historians too. The Chelsea bun was the cronut of the 18th century. According to legend, on the first day that it was introduced by the Old Chelsea Bun House, 50,000 people queued up to buy one. Celebrity fans included Hanoverian royalty; and just like the cronut, this spiced fruit bun, which was once an Easter speciality, spawned dozens of imitations. 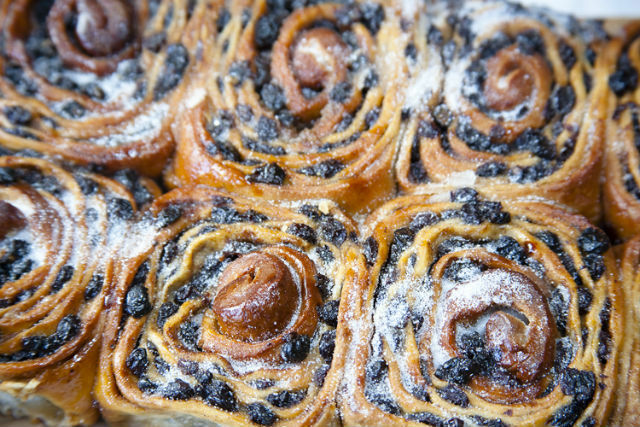 So what is a Chelsea bun? In The Oxford Companion To Food, Alan Davidson described it as a bun made from egg-enriched yeast dough flavoured with lemon peel, cinnamon or mixed spice. When the dough rises, it’s rolled out onto a flat surface and spread with a mixture of currants, brown sugar and butter. It’s then folded, rolled and re-rolled into a square swiss roll shape, then cut into slices. These are then arranged in a single layer in a buttered square tin and left to rise again. The secret to the buns' shape is in getting the spacing between them right at this stage. The buns should rise and snuggle up to each other, restricting further movement, which accounts for their distinctive form. After being baked, they’re brushed with a cold water sugar syrup while still hot, so that when the water evaporates it leaves a sweet sticky glaze. They can be further sprinkled with sugar crystals— but icing and glacé cherries are strictly non-traditional. They’re left to cool on a wire rack where, like typical Chelsea natives, they develop rich, tanned good looks. The buns, which are baked together with their sides touching each other, should be torn apart before serving. They can be eaten warm or at room temperature, just as they are or split and spread with butter. The Chelsea bun was first created around 1700 at the Chelsea Bun House, known variously as the Old Chelsea Bun House and the Old Original Chelsea Bun House. This was a one-storied building with a majestic colonnade situated on Jew’s Row, near Grosvenor Row, by the Ranelagh Pleasure Gardens. None of these places now exist, but according to modern maps, it’s roughly between Pimlico Road and the Royal Hospital Road. There’s a Bunhouse Place with Passmore Street and Bourne Street on either side, close to the remains of the old Ranelagh Gardens, which is believed to be the exact location. Technically, the area is now Pimlico rather than Chelsea — so surely it’s only a matter of time before some enterprising soul relaunches them as ‘Pimlico buns’. The bakery’s most famous proprietor was Richard Hand, affectionately known as ‘Captain Bun’. During his time, the place was frequented by the royal family and other aristocrats. John Timbs says in Curiosities of London (1855) that King George II often visited Hand with Queen Caroline and the princesses, as did his son King George III, and Queen Charlotte, who gifted Mrs Hand a silver half-gallon mug with five guineas. Due to the regal patronage, the bakery became informally known as the Royal Bun House. Fragrant as honey and sweeter in taste! As the flesh of an infant soft, doughy and slight. And it wasn’t just the royal and the literary – the buns were popular with the working classes too. It was customary for working people to buy Chelsea buns along with their hot cross buns from the Chelsea Bun House on a Good Friday. Large crowds would gather on the Five Fields, later developed as Eaton and Belgrave Squares to form Belgravia. The bakery opened very early, at 3am or 4am. Due to an enormous throng, the buns were sold only through the openings in the shutters; and a strong police presence was needed to keep order. In 1792, the congregation of hundreds of thousands of people became so unmanageable and caused so much disturbance that Mrs Hand publicly announced that she wouldn’t sell any hot cross buns the following year — but, says Edward Walford in Old and New London (1878), she promised to continue selling Chelsea buns. George Bryan says in The Original Chelsea Bunhouse: Chelsea in the Olden and Present Times (1869) that Mrs Hand couldn’t keep up the bun ban forever. In 1839, the last year before its demolition, the bakery sold around 240,000 hot cross buns — and although it’s not clear how many Chelsea buns were sold alongside, like many fruit and spice buns at the time, they were just as closely associated with Good Friday, Easter and Whitsuntide (the first three days after the seventh Sunday following Easter). Chelsea buns weren't allowed to be sold on Sundays. From the Morning Post 24 March 1823. 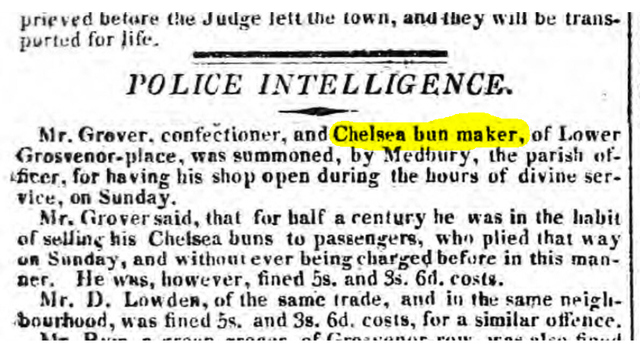 Despite the Easter 1839 spike, sales of Chelsea buns had been falling since 1804 after the Ranelagh closed, according to the London Encyclopaedia. Visitors to these nearby gardens had been an important source of steady income, and its closure led to a decline in the bun trade. After Richard Hand’s death, Mrs Hand continued to run the business, and when she died, their son took over, supplying butter to local customers. After he passed away, his equally eccentric older brother was put in charge. He was a retired military officer, a poor knight of Windsor. According to The Gentleman’s Magazine Vol. 11, when he died in 1839 there were no other family members left to continue, so the bakery reverted to the Crown. The expensive contents described by Sir Richard Phillips were auctioned off. He says their popularity was eventually superseded by bath buns and something called ‘alexander buns’ (for which we’ve not found any references or recipes). Nonetheless Chelsea buns were immortalised in 19th century English literature. Charles Dickens wrote in Barnaby Rudge (1840) about the Gordon Riots of 1780, and how the Royal East London Volunteers marched in “glittering order to the Chelsea Bun House and then regaled in the adjacent taverns until dark.” He also referenced them in Bleak House (1853). In 1855, Anne Manning wrote a novel called The Old Chelsea Bun House: A Tale of the Last Century, a fictional account of life in the bakery with characters based on real people. In 1850, local baker Joseph Tuck (whose name the term ‘tuck shop’ comes from) created a variation, the Hackney bun, at his famous bakery in Goldsmith’s Row, E2. It’s similar to the Chelsea bun, except that the currants are soaked in booze first. “Our recipe is quite traditional… we make a very soft bun dough that we start with a flying sponge. A flying sponge is a method for activating yeast and adding fluffiness to the dough. It involves warming milk to 37 degrees, and whisking in a small amount of flour, fresh yeast and sugar. It rises quickly to three times its size, resulting in a mixture that has a very foamy texture. This is then added to the other dry ingredients [flour, sugar and salt], and mixed until it comes together into a ball; at this stage we start adding butter to add softness. Once the dough is mixed, we allow it to rise and then chill it. Jane Grigson’s English Food and Elizabeth David’s English Bread and Yeast Cookery both contain reliably excellent instructions. A chef at the Peckham Refreshment Rooms has even blogged about David’s classic recipe. The BBC Food website has an easy step-by-step basic recipe. Spiced fruit buns and cakes don’t appeal so much to the modern palate nowadays, and interest in them has been waning — so contemporary recipes with fashionable flavourings have sprung up. Respected food writer Rose Prince jazzes up Chelsea buns with crystallized ginger; and the River Cottage’s version is autumnal, with the addition of apples and walnuts. Baking expert Dan Lepard makes them with marmalade. 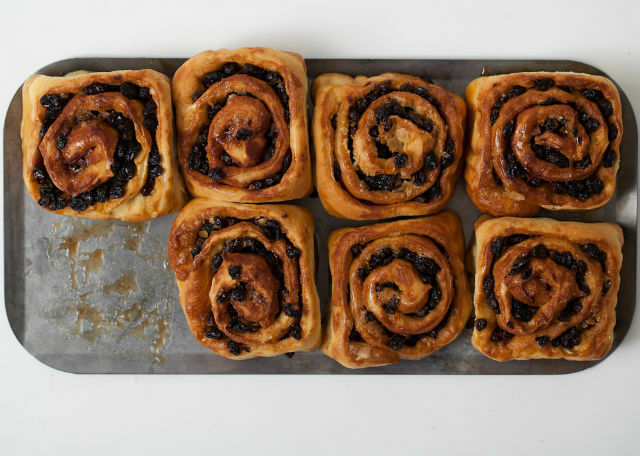 You can learn how to make the basic bun dough that can be used to make Chelsea buns at Bread Ahead's English Baking Workshop. Although dry, stodgy, poor quality Chelsea buns are plentiful in supermarkets, good ones are hard to come by. Jamie Oliver’s Recipease in Notting Hill has freshly baked buns on its breakfast menu; and some central London and Chelsea-based hotels include them on their afternoon tea menu during the Chelsea Flower Show. Balthazar Boulangerie, next to the main restaurant in Covent Garden, sells the buns described by their chef above; and Melrose and Morgan, too, sell Balthazar’s buns in their delis in Primrose Hill and Hampstead. St John Bakery at Maltby Street market sell traditional ones with currants, raisins and brown sugar, flavoured with freshly grated nutmeg and a touch of cinnamon. Crouch End’s Dunn’s Bakery also sell the traditional variety. 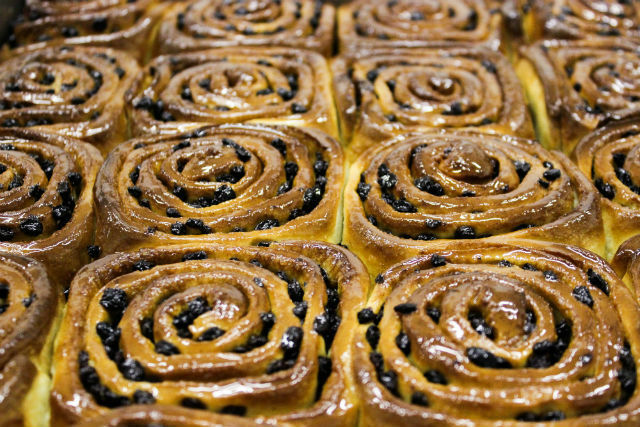 Chelsea buns are founder Oliver Peyton’s favourite product at his Peyton & Byrne bakeries in central London, Greenwich and Richmond. He’s particularly fond of their marmalade version, which he recommends for breakfast. Flour Station sells classic ones made with top Lescure butter at a number of food markets and delis; and their blueberry and pistachio ones are stocked by Islington’s De Beauvoir Deli at the weekends, where they’ve proved to be more popular than the traditional variety. Chelsea’s Megan’s Deli sells blueberry ones, too, made exclusively for them by a small bakery to their own recipe. Honey & Co's ‘Fitzrovia bun’ — their take on the Chelsea bun flavoured with cherries and pistachios — have had their fans in raptures. North London’s ‘free from’ G.O.D. (which stands for ‘gluten outdone’) Bakery sell gluten-free Chelsea buns. Instead of wheat flour, they make a yeasted dough using a mixture of brown rice and tapioca flours, plus psyllium husk for binding. They’re flavoured with currants and cinnamon, and enriched with butter and milk — with vegan versions made using almond milk and organic butter substitute. They’re finished off with a milk or almond milk sugar glaze, and are often available at the Stoke Newington farmers’ market or can be made to order. Sadly, the touristy Chelsea Bun Diner has no Chelsea buns whatsoever on its menu. In fact, aficionados unanimously agree that the most luscious and delicious traditional-style buns are found… not in Chelsea at all, or even in London, but miles away in Cambridge at Fitzbillies. Richard Hand would not have been amused. Thanks to the Museum of London for permission to use copyrighted images of The Old Bun House prints.